How far would you go to make this Valentine’s Day special? Sometimes taking a trip and spending quality time with the person you love goes further than any gift ever could. Cities like Paris and Florence are prime destinations when it comes to lover’s getaways, but what about others? These nine places will surely appeal to you and your partner’s romantic side, whether you prefer relaxing at a beach resort or wine tasting at a vineyard. Thanks to its scenic views, this picturesque volcanic island draws in honeymooners and the romantically inclined all year long. Of all the exotic destinations, Santorini is one of the few places in the world to offer white-, black- and red-sand beaches, thanks to volcanic activity. Located 120 miles southeast of Greece, Santorini has stunning natural sights to visit and a number of romantic activities for two. Spend time in the luxurious capital city of Fira to start, and dine at one of the many rooftop restaurants and wineries. For those looking to take a break from touristy sites, escape to the village of Oia, where you can enjoy a relaxing stay at luxury hotel Mystique Santorini and indulge in its romantic views of the cobalt waters of Caldera. While cities such as Rome, Venice and Florence continue to get hordes of visitors, Verona is one of Italy’s most romantic destinations. Every year, thousands of couples visit this city to feel the romance which dominates this beautiful city, especially during Valentines’ Day. Known as the official home of Shakespeare’s classic, Romeo and Juliet, it comes as no surprise that the entire city celebrates the holiday with a series of events in honor of Valentine’s Day. Stroll through the decorated “Lights of Love” heart display and partake in the three-day Verona In Love Festival. Celebrations include parades, live music around the city, art exhibitions and a poetry contest. If needed, take a break in between the festivities and experience the many streetside cafes and restaurants. 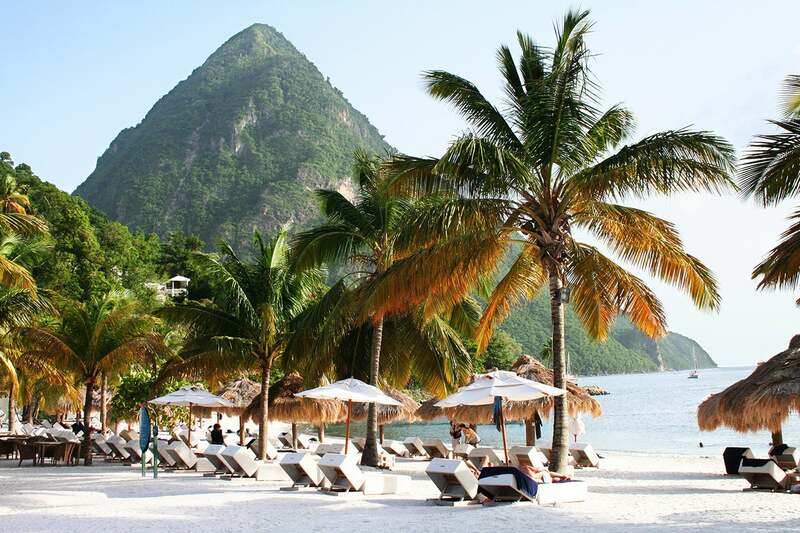 The small island of St.Lucia is the hidden gem of the Eastern Caribbean. The combination of its 98-mile coastline of black- and white-sand beaches and romantic luxe resorts makes this island an ideal romantic paradise. Deemed the best Caribbean Island for honeymooners by USA Today, St. Lucia is known to offer equal parts relaxation and adventure. Couples can spend their days sunbathing in the open-air suites of the many adult-only resorts and enjoying first-class amenities. Beyond the standard lounging on picturesque beaches, you can relax in the Sulphur Springs — the only drive-in volcano in the world. And if that isn’t enough, get a taste of authentic St. Lucian culture and cuisine and experience the many weekend street festivals. Stretching 90 miles between Monterey Bay and San Simeon on the west coast of Central California, you’ll find the remote and peaceful destination of Big Sur. Escape to the wild and rugged coastline, which offers stunning views of the Pacific for miles. The romantic feel of this destination stems from the many restaurants perched high atop the area’s famous coastal cliffs. Brugge beckons over 7 million visitors each year, many of which are honeymooners and traveling couples. The city’s open squares, cobblestone streets and canal create a romantic atmosphere that enthralls tourists. The city is relatively small, leaving you and your better half with ample opportunity to see all the sights and attractions. See why Bruges is referred to as the “Venice of the North” and take a romantic boat ride down the canal while sharing a hot chocolate Belgium-style. Of course, no romantic getaway is complete without a visit to the beautiful Minnewater, where the Lake of Love and Lovers Bridge is located. It is a peaceful and serene place to enjoy the romantic aura of the city — day or night. For those that want to mix adventure and with their romance, look no further than Kauai. 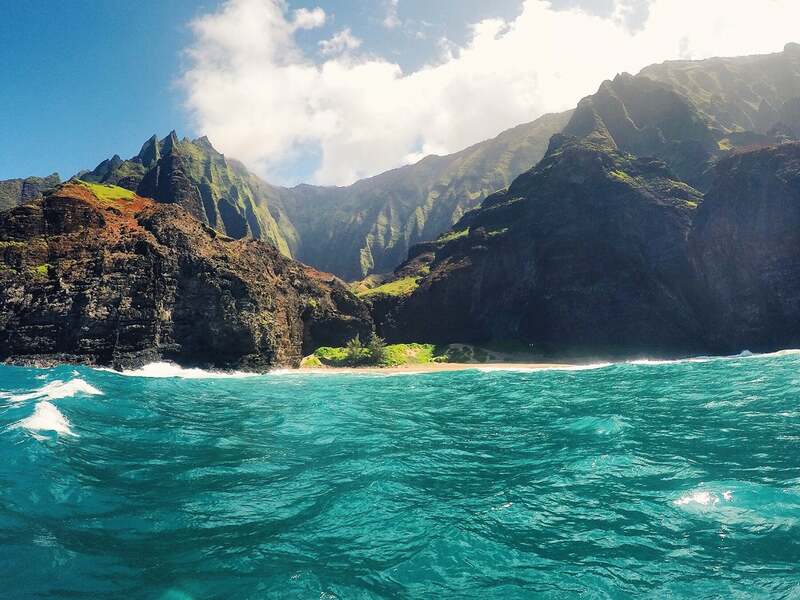 Kauai has everything from stunning landscapes to pristine beaches to signature views. Known as the “Grand Canyon of the Pacific,” visitors can explore the breathtaking canyon and waterfalls. Afterward, you and your partner can partake in surf lessons on the gorgeous North Shore for an even more adventurous experience. The city of Seville positively sizzles with romance. This Andalusian backdrop is the perfect setting for an escape to celebrate Valentine’s Day. Stroll along the Guadalquivir River for scenic views or walk through the streets of Barrio Santa Cruz to get a taste of Seville’s local cuisine. If you want to go beyond the tourist hotspots, cross the river into Traiana and venture through the artsy neighborhood lined with cobbled streets. One of the best ways to enjoy an afternoon with your sweetheart is a horse carriage ride. It’s a great way to experience to the city, especially if you are short of time. Only have time for a romantic weekend stateside? A popular escape for couples is none other than Savannah. What makes Savannah such a romantic destination is its picturesque Spanish moss-filled streets, charming historic homes and, of course, its Southern cuisine. Nothing says “I love you” more than the best fried chicken in the country. While the gorgeous African nation might not be everyone’s first thought for a honeymoon, the East African country does have all the elements for a romantic trip. Considered an under-the-radar African safari, Zambia is a perfect destination for those looking to be mesmerized by the natural wonders of the wilderness. Most hotels offer guests ultimate luxury in the heart of the wilderness, all while fully-immersed in the safari. There’s nothing as awe-inspiring as a romantic sunset cruise on the Zambezi River (except maybe interacting with elephants).